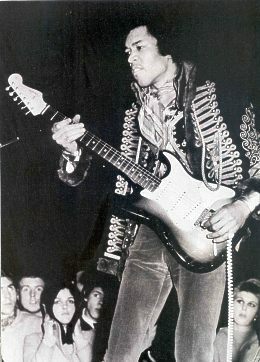 JIMI PLAYS Tulip Bulb Auction Hall - Spalding, England May 29th 1967. 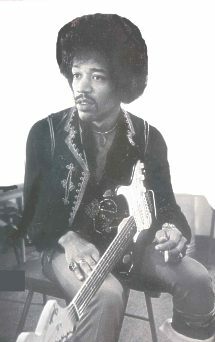 (2) I think Hendrix started first and was loud, vocally incompetent, irritable and a male Diva! Everyone loved him though. He played his guitar with his teeth on 'Hey Joe', stuck the headstock of his Strat throught the mesh of his Marshall stack, threw a guitar into the amp and created a bue flash and smoke, and generally gave a show to remember. His sound balance was dreadful. This was normal at the time. Cream came on next, I think. Eric Of course the real highlight should have been Jimi Hendrix but he was in a foul mood. There was a long delay and Mitch and Noel looking fairly uncomfortable on their own. You'd have thought by then that they'd have worked out a little routine while waiting for the Man but no such inspiration. He then appears and plays a really viscious opening instrumental saying "we're just jamming" and then starts to complain that he's just come over from Germany as if that was all our fault. Eventually the set did settle down and I think "The Wind Cries Mary" might have been a high spot - his new release. But it was all over in half an hour (that set) and we were trudging out having a distinctly cheated feeling about the whole thing. Nothing much was said at school next day (my calendar tells me it was a Monday night). (3)The only thing I remember about the Jimi Hendrix Experience was Jimi trying to get some feedback from the amps and a roadie trying to stop them crashing like a pack of cards. 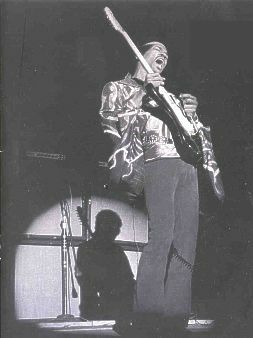 The scene was very similar to the photograph on the cover of the Jimi bootleg "Listen To This Eric". My biggest memory is that Jimi kept us waiting for ages and he irritated everyone so much that he received the slow hand clap. When he came on his mood was awful and he played a short set and finally pushed all the amps over and stormed off! (4) The most popular bands were Geno Washington, Cream and of course Jimi Hendrix Experience....l sat and chatted with Jimi who seemed to be alone, and separate from his bass player and drummer. Suddenly the dressing room doors (actually it was a large trailer), burst open, and crowds of people shouted THERES JIMI, and grabbed my yellow frilly shirt, which they thought was his. They ripped it up between themselves and ran back into the Car Park waving the shirt in the air saying...."we've got Jimi's Shirt"
(5) Jimi was in a bad mood though and was late going on....the sound was awful, so he took it out on his equipment smashing his amps and setting fire to his guitar....l've no idea what happened to the guitar, but chances are it ended up on the town dump with all the rubbish. Can you imagine its value nowadays???? ?